There is no better way to explore the French countryside than with a donkey as a companion. Your donkey soon becomes a devoted friend, who will carry both bags and young children, provide companionship and maybe lead the way, and all in return for some love. And some food, of course! Donkeys are gentle creatures who form firm bonds with their friends. Because of this, I highly recommend that you take two donkeys with you. If you have children, one can carry the luggage and the other can carry the children. There are a number of donkey hirers across France. You typically hire the donkey for a day or two, or for a week with the hirer providing harness, saddle, grooming tools, food and instruction. Some organise a tour and accommodation. There are numerous websites listing donkey hirers across France. Click here for a comprehensive list. After scouring the lists and studying websites, my husband, 9-year old daughter and I plumped for a week-long trip operated by Balladanes, based on the outskirts of Bédarieux, in the Hérault region of Languedoc-Roussillon, a region with wide-open spaces, beautiful countryside and red rocks. Upon arrival, we were greeted with drinks and snacks, before being introduced to our donkey for the week, Loukoum. He was a spritely, clever, funny and affectionate donkey, who we were all sorry to say goodbye to at the end of our week. We were given instructions on how to look after him, maps and a booklet containing our route for the week. We spent the first night at the owners’ farmhouse gite, Mas de Riols, and the next morning we tacked up our donkey, loaded our bags onto his saddle and set off on our very own adventure. Each day we walked between 5 and 15 km, stopping each night in a different place. In the event of a problem, we could call the owners for advice or for collection. 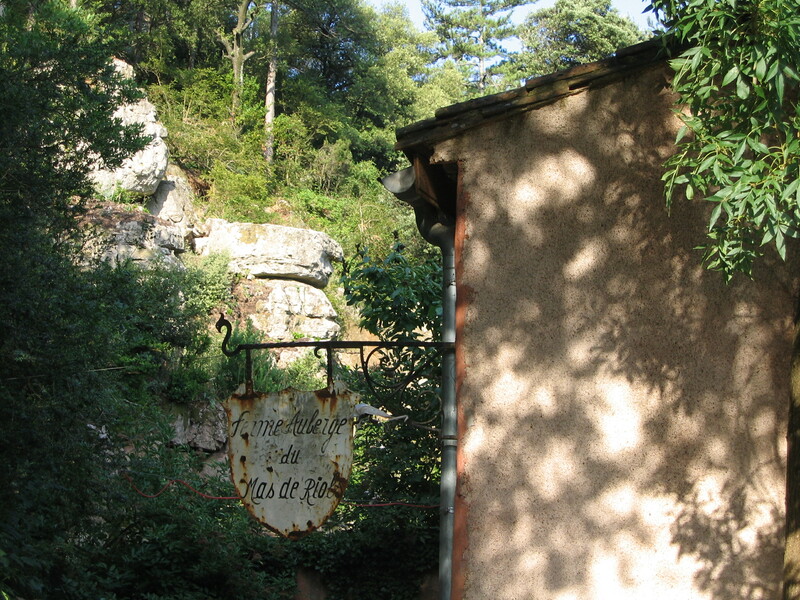 The accommodation was something of a mixed bag – smart schoolhouse converted into gite, guest house with swimming pool, a basic tent, scruffy gite. The thing these places all had in common, though, was marvellous hospitality. We were greeted like friends at each stop, food was produced for Loukoum, and we were treated to a fabulous evening meal. Each morning, after breakfast, our friendly hosts loaded us down with goodies for lunch, always including wine and coffee. The walking was relatively easy, though it was hot in August. I should mention that my daughter was not a keen walker, and was too old to ride on the donkey together with the luggage. Having Loukoum as a companion, however, kept her happy and interested and there was never a word of complaint. The surroundings were beautiful and oh so peaceful. Loukoum was generally obedient and willing to go wherever we wanted, with a couple of exceptions! Occasionally we would pass a family doing the same circuit as us but in the opposite direction. Donkeys love companionship and Loukoum, though seemingly devoted to us, would far rather run off with the other donkey! We soon learned that the safest thing to do was to tie him to a tree as soon as we heard another donkey approaching. He also broke out of his field on two evenings in attempt either to find us, or to find another donkey. All in all, a great holiday, and one I recommend to families or walkers looking for something a little different. A word of warning: I would say that for this particular holiday, at least one of you needs to have reasonable French. The instructions were entirely in French and most of the hosts did not speak English.